(DEC 11) Vandenberg Air Force Base, Calif. - The launch of a United Launch Alliance Atlas V rocket carrying the NROL-35 payload for the National Reconnaissance Office was scrubbed today due to predicted violations of multiple weather criteria. 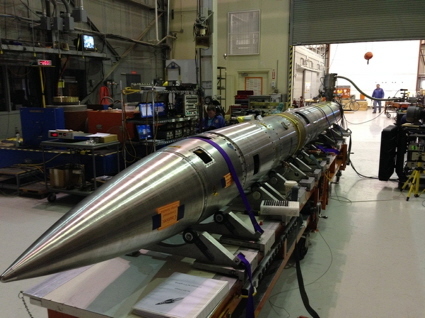 The launch is rescheduled for Friday, Dec. 12 from Space Launch Complex-3 at Vandenberg Air Force Base, Cal. The launch time is 7:13 p.m. PST. The forecast for Dec. 12 shows a 40 percent chance of favorable weather conditions for the launch tomorrow. (DEC 8) VANDENBERG AIR FORCE BASE, Calif. - Team Vandenberg is scheduled to launch a United Launch Alliance Atlas V rocket carrying a National Reconnaissance Office payload from Space Launch Complex-3 here Thursday, Dec. 11, with a launch window opening at 7:17 p.m. PDT. Col. Keith Balts, 30th Space Wing commander will be the launch decision authority. "Our team and mission partners have put a lot of hard work into preparing for this important mission for our Nation," said Balts. "We are looking forward to a safe and successful launch to close out an amazing year." The 4th Space Launch Squadron is in charge of mission assurance and safety for this launch operation. "A launch like this takes teamwork and dedication," said Lt. Col. James Bodnar, 4th SLS commander. "Our mission assurance technicians and engineers have worked hand-in-hand with United Launch Alliance going over critical procedures and tasks to ensure this launch is a safe and successful one." (NOV 19) SANTA BARBARA, Calif. - This month's public viewing of the stars will feature astronomical glimpses of a heart, owl and a Christmas tree on Friday, Nov. 21, beginning after 6:30 p.m. and lasting for several hours at the Westmont Observatory. The free event is held every third Friday of the month in conjunction with the Santa Barbara Astronomical Unit. In case of inclement or overcast weather, please call the Telescope Viewing Hotline at (805) 565-6272 and check the Westmont website to see if the viewing has been canceled. Thomas Whittemore, Westmont physics instructor, says he hopes to aim Westmont's 8-inch refractor telescope at the northern part of the sky where there'll be a number of open clusters with interesting patterns of stars. (NOV 14) LAS CRUCES, NM -The NMSU Department of Astronomy and Southern New Mexico Natural History Foundation will host a Sky Safari event from 7 to 9 p.m. Saturday, Nov. 15, at the NMSU Campus Observatory. Participants will be able to observe the Andromeda Galaxy as well as several open and globular star clusters. 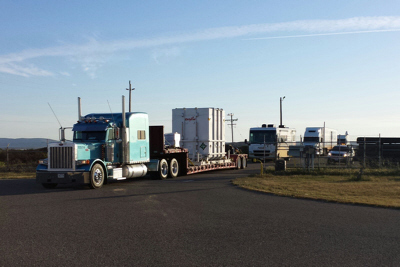 (NOV 6) SUNNYVALE, Calif. - The U.S. Navy and Lockheed Martin [NYSE: LMT] have delivered the third Mobile User Objective System (MUOS) spacecraft to Cape Canaveral Air Force Station, Florida, where it will be prepared for a January 2015 liftoff aboard a United Launch Alliance Atlas V rocket. "The delivery of MUOS-3 is an important step toward enabling our warfighters to be able to pick up the phone to seamlessly call or transfer data anywhere around the world," said Iris Bombelyn, vice president of Narrowband Communications at Lockheed Martin. "With the launch of the third satellite in the constellation, to be followed later in 2015 by the fourth, MUOS will be in place to provide pole-to-pole and global, secure communications for the warfighter." MUOS-3's safe transport to Cape Canaveral Air Force Station began from Lockheed Martin's Sunnyvale, California, facility to nearby Moffett Federal Airfield. There, the 60th Air Mobility Wing of Travis Air Force Base loaded the satellite aboard a C-5 aircraft for final shipment on Nov. 5. Lockheed Martin Space Systems, Sunnyvale, California, is the MUOS prime contractor and system integrator. The Navy's Program Executive Office for Space Systems and its Communications Satellite Program Office, San Diego, California, are responsible for the MUOS program. (OCT 22) NASA has awarded a sole source contract modification to Northrop Grumman Electronic Systems, of Azusa, California, for the Advanced Technology Microwave Sounder (ATMS) Instrument for flight on the Joint Polar Satellite System-2 (JPSS-2) mission. This is a cost-plus-award-fee modification in the amount of $121 million. The JPSS-2 mission is funded by the National Oceanic and Atmospheric Administration (NOAA) to provide global environmental data in low-Earth polar orbit in support of NOAA's mission. Under this contract, Northrop Grumman Electronic Systems will manufacture, test and deliver the ATMS instrument, support instrument integration on the JPSS-2 spacecraft and provide launch and post-launch support. ATMS is a passive microwave instrument that works in conjunction with the Cross-track Infrared Sounder (CrIS) to produce global atmospheric temperature and moisture profiles. ATMS provides high spatial resolution microwave data to support temperature and humidity sounding data in all weather conditions. 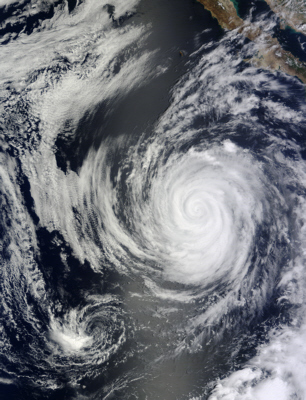 NOAA forecasters will use this data in computer models to improve global and regional predictions of weather patterns, storm tracks and precipitation. 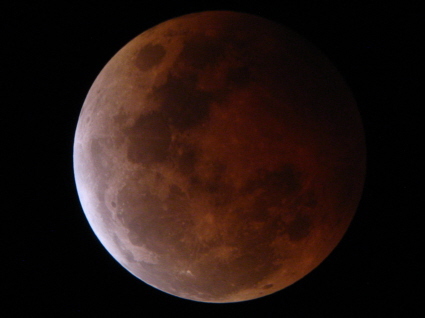 The full Moon takes on a dull copper-red color during a total lunar eclipse on October 9. 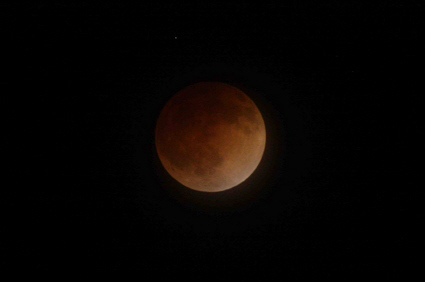 The pre-dawn event was visible to the unaided eye from the U.S. West Coast and beyond. Robert Lunsford recorded this image of the Moon during totality from Chula Vista, California at 04:15 PDT using a 9.25-inch Schmidt-Cassegrain telescope, Canon Power Shot S2 IS camera, and an exposure time of 1.3 seconds. Image copyright 2014, Robert Lunsford. Used with permission. (SEP 23) VANDENBERG AIR FORCE BASE, Calif. - An unarmed Minuteman III intercontinental ballistic missile was launched during an operational test at 7:45 a.m. here Tuesday. Col. Keith Balts, 30th Space Wing commander, was the launch decision authority. "An outstanding display of teamwork ensured 100-percent mission success for the first Minuteman launch of the year here at Vandenberg," said Col. Balts. "We constantly focus on flawless execution of our launch, range and expeditionary missions. I am extremely proud of the collaboration between the 30th SW and the 576th FLTS." 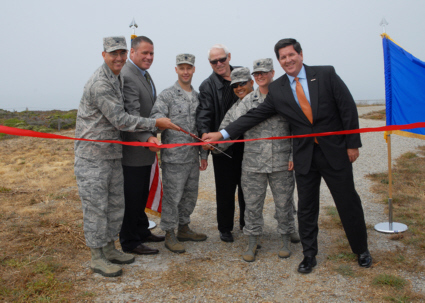 U.S. Air Force and InDyne dignitaries participate in a ribbon cutting ceremony September 10 at Pillar Point Air Force Station, Calif. Located four hours north of Vandenberg AFB, Pillar Point supports launches from Vandenberg by transmitting commands to destroy vehicles in the event of an anomaly and by receiving telemetry transmitted from vehicles during flight. The ceremony marked the modernization of Pillar Point AFS through replacement of the Command Transmitter 4, which was in service since the 1960's, and a major modification involving the facility's telemetry system. U.S. Air Force photo by Senior Airman Armando Aparicio Jr.
(SEP 2) MOUNTAIN VIEW, Calif. - For the first time since 1997, NASA's Ames Research Center in Moffett Field, California, will open its gates and share its world-class space and aeronautics research campus with surrounding communities on Oct. 18, 2014. Starting today, free general admission tickets are available for the event. The event will feature exhibits highlighting Ames' space missions, a two-mile, self-guided walking tour past facilities including huge wind tunnels and Ames' simulated Martian landscape, opportunities to visit with Ames engineers and scientists, and family-friendly talks with Ames researchers. Participants can learn more about Ames' major contributions to the International Space Station, the Curiosity Mars rover, the Lunar Atmosphere and Dust Environment Explorer (LADEE) orbiter, the Stratospheric Observatory for Infrared Astronomy (SOFIA) research aircraft and the planet-hunting Kepler mission, and see demonstrations of technologies invented at Ames in the center's 75-year history. Tickets with reserved entry times are required. This is a pedestrian-only event; no on-site visitor parking will be permitted. Public transportation is highly encouraged. Buses will shuttle visitors from local public transit stations to Ames. Other transportation options will be posted on the event website. (AUG 29) The launch of NASA's SMAP spacecraft from Vandenberg AFB has been delayed indefinitely. 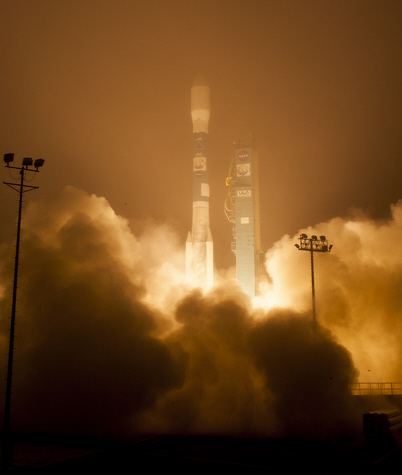 The soil moisture-measuring mission was slated to lift-off aboard a Delta II rocket shortly after sunrise on November 5. A Jet Propulsion Laboratory official told Space Archive that the launch was delayed to allow for additional testing and evaluation that includes the SMAP antenna Reflector Boom Assembly (RBA). The purpose of the additional testing and evaluation is to ensure that the spacecraft will function as intended after launch. The official also said that the launch date is currently listed as indefinite. However, NASA will attempt to identify the earliest possible launch opportunity between mid-December and late February. 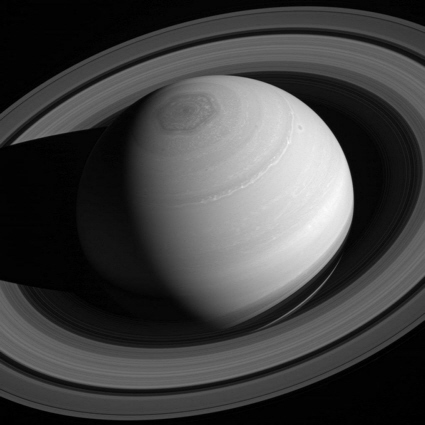 NASA should announce a new date in late September. (AUG 20) SACRAMENTO, Calif., - Aerojet Rocketdyne, a GenCorp (NYSE: GY) company, has received the Outstanding Achievement Award from the Electric Propulsion Technical Committee at the American Institute of Aeronautics & Astronautics for its contribution to the Advanced Extremely High Frequency-1 (AEHF-1) Rescue Team. The team, which included two other aerospace companies and the U.S. Air Force, helped save the AEHF-1 military communications satellite and place it into proper orbit after the spacecraft's main bipropellant engine failed to ignite. The AEHF-1 satellite was successfully launched aboard a United Launch Alliance Atlas V booster in August 2010, and was expected to reach geosynchronous orbit within 100 days. But the bi-propellant propulsion system on the satellite's main engine failed, stranding the AEHF-1 in the wrong orbit and placing it at risk of being a total loss. The AEHF-1 Rescue Team was assembled and devised a plan to use the spacecraft's smaller hydrazine thrusters to lift the orbit above the atmosphere and then use the electric Hall thruster system to complete the orbit-raising mission-with whisper-like impulses-until it reached its desired orbit 14 months later. (AUG 13) VANDENBERG AIR FORCE BASE, Calif. - Team Vandenberg supported the successful launch of a commercial satellite on a United Launch Alliance Atlas V rocket from Space Launch Complex-3 here Wednesday, Aug. 13, at 11:30 a.m. PDT. Col. Marc Del Rosario, 30th Operations Group commander, was the launch decision authority. "The 30th Space Wing is proud of supporting the successful launch of a high-resolution commercial earth imaging satellite with the United Launch Alliance team," said Del Rosario. "Today's launch is a testament to the professionalism and commitment to mission assurance, public safety, and mission success on the Western Range." The Atlas V rocket carried the DigitalGlobe WorldView-3 satellite. This satellite will further enhance the DigitalGlobe collection capacity for more rapid and reliable collection and expand its imagery product offerings. (AUG 7) VANDENBERG AIR FORCE BASE, Calif. - Team Vandenberg is scheduled to launch the WorldView-3 satellite on an Atlas V rocket from Space Launch Complex-3 here Wednesday, Aug. 13, with a launch window opening at 11:29 a.m. PDT. The WorldView-3 satellite was built by DigitalGlobe and United Launch Alliance builds and flies the rocket. The 30th Space Wing at Vandenberg Air Force Base is responsible for range safety and launch operations. Col. Marc Del Rosario, 30th Operations Group commander, will be the launch decision authority. "The entire 30th Space Wing team of military, government civilians, and contractors are all honored to launch the first Atlas V commercial mission from Vandenberg AFB. The team's planning and behind the scenes hard-work with United Launch Alliance, Lockheed Martin, and the Federal Aviation Administration are all integral to provide safe launch operations on the Western Range," said Del Rosario, this mission's launch decision authority. WorldView-3 is the first multi-payload, super-spectral, high-resolution commercial satellite. 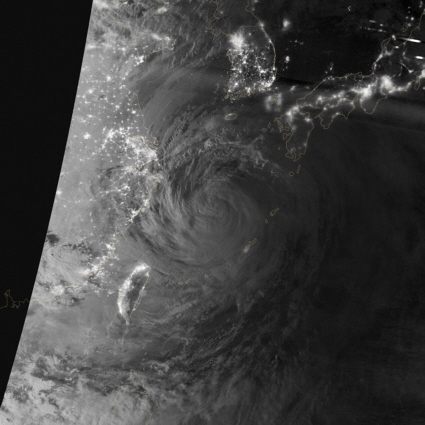 The satellite will provide 31 cm panchromatic resolution, 1.24 m multispectral resolution, and 3.7 m short-wave infrared resolution with an average revisit time of less than 1 day. 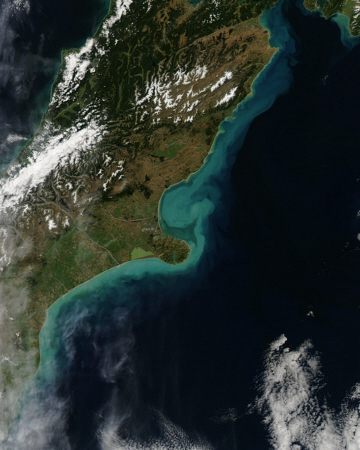 This will further enhance the DigitalGlobe collection capacity for more rapid and reliable collection and expand its imagery product offerings. 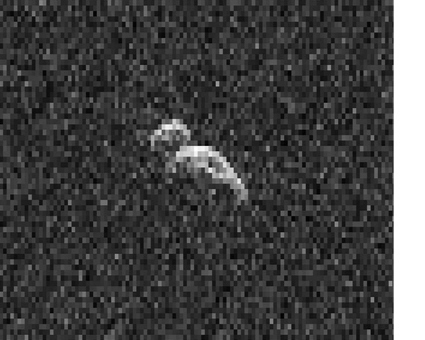 Once thought to be an asteroid, Comet C/2013 UQ4 (Catalina) glows brightly in this recently released infrared image from NASA's Wide-field Infrared Survey Explorer (WISE) spacecraft. 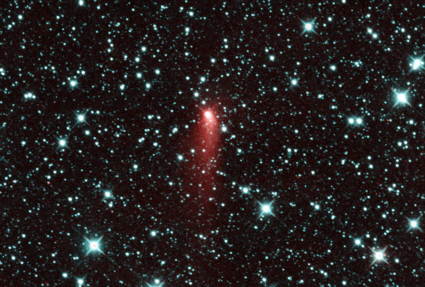 WISE imaged the comet just one day after the object's closest approach to the sun. 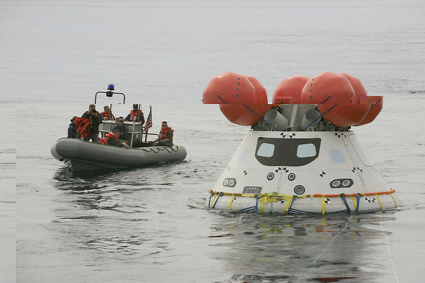 WISE was launched from Vandenberg AFB, Calif. in late 2009. "Following last week's successful launch of six ORBCOMM satellites, the Falcon 9 rocket's first stage reentered Earth's atmosphere and soft landed in the Atlantic Ocean. This test confirms that the Falcon 9 booster is able to consistently reenter from space at hypersonic velocity, restart main engines twice, deploy landing legs and touch down at near zero velocity. After landing, the vehicle tipped sideways as planned to its final water safing state in a nearly horizontal position. The water impact caused loss of hull integrity, but we received all the necessary data to achieve a successful landing on a future flight. Going forward, we are taking steps to minimize the build up of ice and spots on the camera housing in order to gather improved video on future launches. At this point, we are highly confident of being able to land successfully on a floating launch pad or back at the launch site and refly the rocket with no required refurbishment. However, our next couple launches are for very high velocity geostationary satellite missions, which don't allow enough residual propellant for landing. In the longer term, missions like that will fly on Falcon Heavy, but until then Falcon 9 will need to fly in expendable mode. 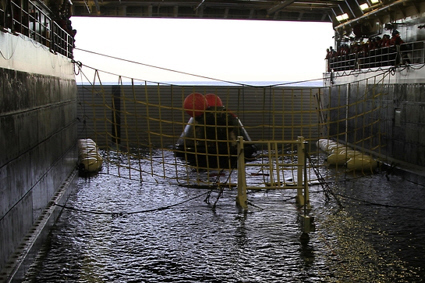 We will attempt our next water landing on flight 13 of Falcon 9, but with a low probability of success. Flights 14 and 15 will attempt to land on a solid surface with an improved probability of success." (JUL 15) HUNTINGTON BEACH, Calif., July 15, 2014 - Boeing [NYSE: BA] plans to design a reusable launch vehicle for the Defense Advanced Research Projects Agency (DARPA) in support of the U.S. government's efforts to reduce satellite launch costs. DARPA's XS-1 Experimental Spaceplane is conceived as a reusable, unmanned booster with costs, operation and reliability similar to modern aircraft. Under the $4 million preliminary design contract, Boeing plans to work on a reusable first stage launch vehicle capable of carrying and deploying an upper stage to launch small satellite payloads of 3,000 to 5,000 pounds (1,361 kg to 2,268 kg) into low-Earth orbit. "Our design would allow the autonomous booster to carry the second stage and payload to high altitude and deploy them into space. The booster would then return to Earth, where it could be quickly prepared for the next flight by applying operation and maintenance principles similar to modern aircraft." said Will Hampton, Boeing XS-1 program manager. DARPA plans to hold a Phase II competition next year for the follow-on production order to build the vehicle and conduct demonstration flights. (JUL 9) Join dozens of astronomy product manufacturers, organizations, and clubs at Oceanside Photo and Telescope's annual Southern California Astronomy Expo on Saturday, July 12th. 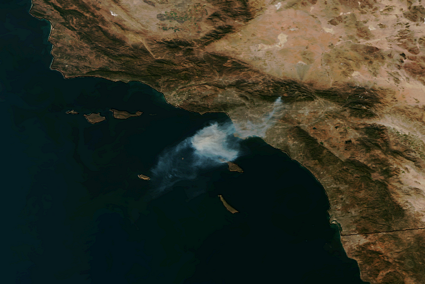 The free event will be held from 10 a.m. - 6 p.m. at OPT's showroom at 918 Mission Ave., Oceanside, Calif.
(JUL 2) VANDENBERG AIR FORCE BASE, Calif. - A NASA satellite on a United Launch Alliance rocket was launched from Space Launch Complex-2 here Wednesday, July 2, at 2:56 a.m. PDT. The Delta II rocket carried NASA's Orbiting Carbon Observatory-2; the second of NASA's five Earth science missions to launch in 2014. 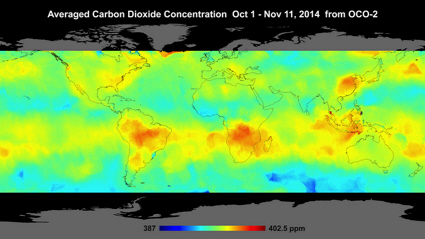 OCO-2 is NASA's first mission dedicated to studying atmospheric carbon dioxide, the leading human-produced greenhouse gas driving changes in Earth's climate. 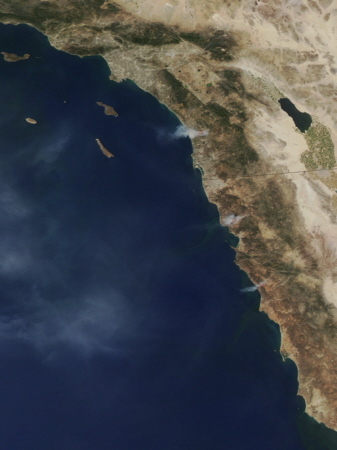 OCO-2 will provide a new tool for understanding the human and natural sources of carbon dioxide emissions and the natural "sinks" that absorb carbon dioxide and help control its buildup. The observatory will study their changes over time. 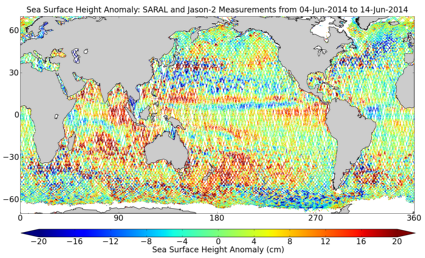 The height of the surface of the world's oceans is revealed in this recent image created from data from India's SARAL and NASA's Jason-2 satellites. The highest areas are shown in red and the lowest areas are in blue. Jason-2 was launched from Vandenberg AFB in 2008. "Engineers and technicians performed additional mechanical preparations so OCO-2 would be ready for its move to Space Launch Complex 2 at Vandenberg Air Force Base in California. Currently inside the Astrotech payload processing facility at Vandenberg, the OCO-2 spacecraft will be taken to the launch pad in the early morning on Saturday and hoisted to the top of the United Launch Alliance Delta II rocket already assembled there. 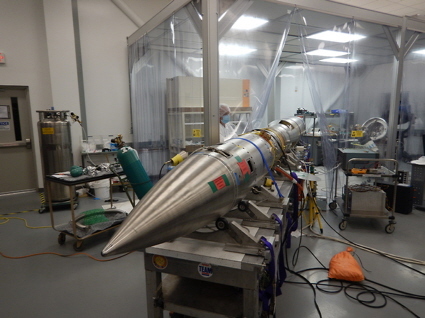 The carbon observatory will be encapsulated in its payload fairing June 20 for launch July 1 at 2:56:44 a.m. PDT." (JUN 4) LOS ANGELES AIR FORCE BASE, El Segundo, Calif. --- The Air Force awarded a $914,699,474 contract to Lockheed Martin on June 2, 2014 to develop a system that will track objects in Earth's orbit with far greater confidence and fidelity. The contract brings the program to final system development with the delivery of Space Fence Increment 1, or site 1, radar and a Space Fence operations center. The projected initial operational capability is fiscal year 2019. The contract also includes an option for procuring a second radar site. The system will track space objects in Earth's orbit. According to program officials, it will improve space situational awareness by detecting and tracking objects such as commercial and military satellites and debris from break-up events. Coverage will extend down to just above the horizon to handle low-inclination orbits. Space Fence is designed to provide assured coverage at low Earth orbit for objects as small as 10 centimeters. The system will also support cued searches and uncued surveillance at medium Earth orbit and above. (MAY 19) NASA and its international partners now have the go-ahead to begin construction on a new Mars lander after it completed a successful Mission Critical Design Review on Friday. 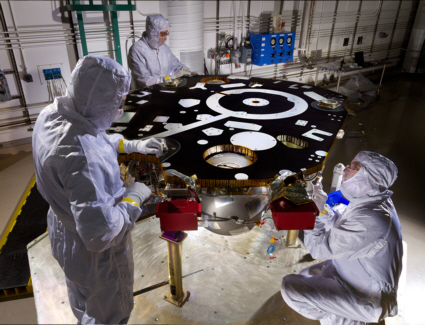 NASA's Interior Exploration Using Seismic Investigations, Geodesy and Heat Transport (InSight) mission will pierce beneath the Martian surface to study its interior. The mission will investigate how Earth-like planets formed and developed their layered inner structure of core, mantle and crust, and will collect information about those interior zones using instruments never before used on Mars. 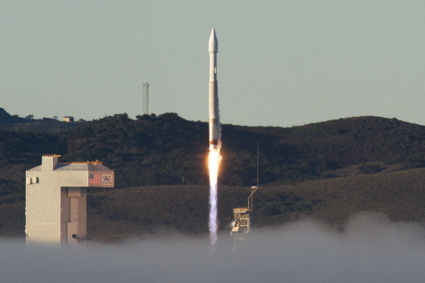 InSight will launch from Vandenberg Air Force Base, on the central California coast near Lompoc, in March 2016. This will be the first interplanetary mission ever to launch from California. The mission will help inform the agency's goal of sending a human mission to Mars in the 2030's. (MAY 13) SANTA BARBARA, Calif. - Westmont's powerful Keck Telescope will zoom in on the planet Mars during a free, public viewing Friday, May 16, beginning at 7:30 p.m. The best viewing generally occurs later in the evening. In case of inclement or overcast weather, please call the Telescope Viewing Hotline at (805) 565-6272 and check the Westmont website to see if the viewing has been canceled. As Jupiter continues to get lower in the western sky, Thomas Whittemore, Westmont physics instructor, says the target this month will be Mars. 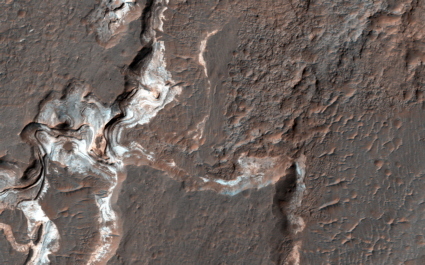 "Last month, because of the steady skies, we were able to see, at high power, one of Mars' polar caps," he says. (APR 13) If the weather cooperates, observers in the Southwest and beyond will be well situated to see a total lunar eclipse on the night of April 14-15. As seen from California, the Moon will be well above the horizon for the entire event. Partial eclipse begins 10:58 p.m. Partial eclipse ends 2:33 a.m.
All you will need to see the event are the unaided eye and perhaps a reclining chair. For the best view, use tripod-mounted binoculars or a small telescope at low magnification. Throughout the night, the Moon will be accompanied by Mars. The orange-red planet will be shining brightly about 9 degrees to the Moon's upper right at maximum eclipse. Although the two objects will appear to be relatively close, Mars will actually be some 57 million miles behind the Moon. (MAR 11) EL SEGUNDO Calif., March 11, 2014 -- Boeing's [NYSE: BA] first of four satellites for Inmarsat's Global Xpress network, has passed all of its on-orbit testing and has now been handed over to Inmarsat. The high-speed mobile broadband satellite, launched on Dec. 8, will support a wide range of government and commercial customer uses, including in-flight connectivity, communications for vessels at sea, streaming video and other voice and data services. Boeing is under contract to build four Inmarsat-5 satellites, with two more scheduled for completion and launch by the close of 2014. The fourth satellite is scheduled to be delivered in 2016. The Inmarsat-5 satellites carry a secondary payload that Boeing Commercial Satellite Services will lease to potential government customers through a reseller agreement with Inmarsat. (FEB 18) SANTA BARBARA, Calif. - Stargazers might enjoy views of Jupiter's Great Red Spot at this month's public viewing at the Westmont Observatory on Friday, Feb. 21, beginning after 6:30 p.m. and lasting several hours. The free event is held every third Friday of the month in conjunction with the Santa Barbara Astronomical Unit. In case of inclement or overcast weather, please call the Telescope Viewing Hotline at (805) 565-6272 and check the Westmont website to see if the viewing has been canceled. "Jupiter will be near the top of the sky during the early hours of the public viewing, so we should get some clear and steady views of the planet and maybe the ancient storm," says Thomas Whittemore, Westmont physics instructor. The Great Orion Nebula may also be a highlight of the viewing. "If the weather cooperates, we may be able to see all six of the Trapezium stars in this distant stellar nursery," he says. Last month, visitors enjoyed testing their color sense with several binary stars that Whittemore targeted. 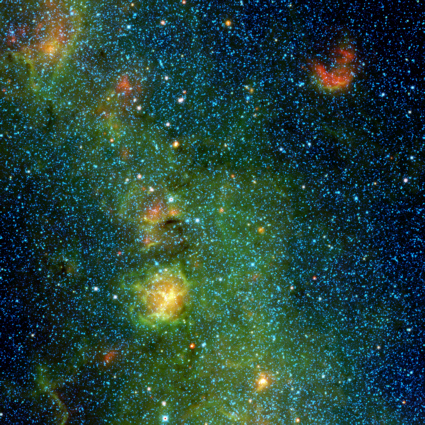 "One of my favorites was the green-reddish pair in the system, Eta Cassiopeiae," he says. "These stars are about 20 light-years away and take 500 years to orbit one another. Although they may look like they are on top of one another in the telescope, the two stars of Eta Cassiopeiae are separated by more than twice the distance Pluto is from our sun." Westmont students and faculty use the Keck Telescope, a 24-inch reflector, to conduct astronomical research. The observatory sits between Russell Carr Field and the track and field/soccer complex. Free parking is available near the baseball field. (FEB 6) NASA has selected 16 small satellites from nine states to fly as auxiliary payloads aboard rockets planned to launch in 2015, 2016 and 2017. The proposed CubeSats come from universities across the country, a primary school, non-profit organizations and NASA field centers. CubeSats are a class of research spacecraft called nanosatellites. The cube-shaped satellites measure about 4 inches on each side, have a volume of about 1 quart and weigh less than 3 pounds. (JAN 22) LOS ANGELES AIR FORCE BASE, El Segundo, Calif. - Since October 2012, U.S. Air Force Space Command's Space and Missile Systems Center (SMC) has been analyzing, characterizing, testing and implementing modified battery charge control rates across the GPS IIR/IIR-M fleet. This fleet of 19 satellites comprises more than half of the Global Positioning System (GPS) constellation. As of November 15, 2013, the USAF's 2nd Space Operations Squadron (2SOPS) completed the modification, which will extend the life of these satellites' operational capability. Batteries are projected to be the primary life-limiting component when GPS IIR/IIR-M vehicles are past their design life. Analysis by SMC, The Aerospace Corporation and Lockheed Martin indicated that reducing the charge rates during solstice season would add an average of one to two years of life per space vehicle. SMC GPS directorate and 2SOPS will closely monitor the real-world results of this project to ensure they are in line with the expected gains. In total, it is anticipated that the modification will add more than 27 years of cumulative life across the GPS IIR/IIR-M fleet. (JAN 15) SANTA BARBARA, Calif. - The gas giant Jupiter will be the star performer at this month's public viewing at the Westmont Observatory on Friday, Jan. 17, beginning after 6:30 p.m. and lasting several hours. The free event is held every third Friday of the month in conjunction with the Santa Barbara Astronomical Unit. In case of inclement or overcast weather, please call the Telescope Viewing Hotline at (805) 565-6272 and check the Westmont website to see if the viewing has been canceled. "Jupiter will split the four Galilean Moons with Callisto, Europa and Ganymede on one side of the planet and Io on the other side," says Thomas Whittemore, Westmont physics instructor. "It will be interesting to see this alignment as Callisto, the outermost of the Galilean Moons, lies very far from Jupiter." With the Sun currently at the peak of its 11-year cycle, our star's surface is populated with several spots or "active regions." 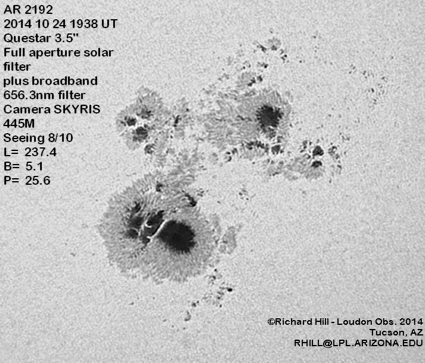 Rik Hill imaged one such region, AR 1944, on January 3 from Tucson, Arizona using a 3.5-inch telescope and an electronic camera. AR 1944 unleased a coronal mass ejection (CME) in the general direction of Earth on January 4 and will probably release an M-class solar flare on January 5. Image Copyright 2014, Richard Hill. Used with permission. Copyright © 2013-2015, Brian Webb. All rights reserved.